(5/1/2018) The Electrolysis Project is officially complete. Mozilla continues to work on scaling the Gecko process model through newer projects and work, including our process-per-origin initiative Project Fission. Props and thanks to our entire community for helping us ship this body work. We could not have successfully shipped this without your help! In the future Electrolysis child processes may be used to handle other browser tasks including audio, networking (bug 1322426), PDFium and Pepper Flash (bug 558184). In Mozilla documentation "Electrolysis" is often shorted as "e10s". If you're currently using Firefox Beta you might be testing e10s already, check about:support and look for a number higher than 0 in the "Multiprocess Windows" entry. If you would like to opt-in to help us test open about:config and toggle browser.tabs.remote.autostart to true. On your next restart, e10s should be active. If you're using Firefox 48 or later, you might be using e10s already. Check about:support and look for a number higher than 0 in the "Multiprocess Windows" entry. If you would like to opt-in, open about:config and toggle browser.tabs.remote.autostart to true. On your next restart, e10s should be active. If you've tried enabling e10s following the instruction above, but your about:support indicates that e10s is disabled (e.g., accessibility, add-ons can trigger this), you can force e10s on for testing purposes. Within about:config create a new boolean pref named browser.tabs.remote.force-enable and set it to true. This is not encouraged, use it at your own risk! View the Multiple Content Process wiki page for more information about release milestones, release criteria, and a gradual roll-out schedule of e10s-multi. The following schedule covers rollout of the single content process feature to release builds up to Firefox 54. Multi process is covered starting in Nightly 54. What percent of the population actually has e10s enabled? qualifying users: users that do not use addons and have not activated accessibility support over 30 days. The following schedule rollout of Electrolysis as it releases specifically to add-ons. 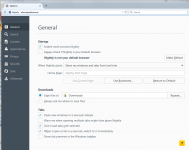 Each release of Firefox will add more and more add-ons to the cohort of users who get multi process Firefox. Users with add-ons not in yet the cohort to get multi-process, will continue to run Firefox (as before) without e10s enabled. The Road to 57 blog post has details and there is a visual of the schedule here. 51 Moving back to Fx 50 release criteria. All Extensions and all WebExtensions , , , plus 770 add-ons testing in Beta that were not marked either way (initial expansion) had been included. 53 all Extensions marked "multiprocessCompatible" and all WebExtensions . 54 all Extensions marked "multiprocessCompatible" and all WebExtensions . 55 all Extensions marked "multiprocessCompatible" and all WebExtensions . 56 all Extensions marked "multiprocessCompatible" and all WebExtensions . Before each stage moves from beta to release, there are release criteria (crashes, jank etc) that need to be met. We will delay moving to Release if issues are identified in Beta. Initially Shims will be available that will help certain add-ons with compatibility. These are a temporary measure due to potential limitations that could impact user experience. With the exception of Extensions marked explicitly as NOT multiprocessCompatible. For information on add-on support rollout see the Add-on/e10s Project Wiki. To read a summary of the Roll-Out plan, see Asa's blog. Due to stability issues Windows XP is currently not leveraging e10s on release channel. XP and Vista will move out to Extended Support Release (ESR) 45 when 45 merges to release (bug 1303827). As such there are no plans to support e10s for XP/Vista in the future. The simplest way to help out is to test a release that has e10s enabled, and file bug when you find them. Please try to find duplicates prior to filing. For developers interested in helping out, MDN has a good introduction to e10s, useful for both Firefox and add-on developers. See the Security Sandbox wiki page for more information and status. See the e10s Accessibility wiki page for support implementation detail. Add-on authors should refer to the MDN Firefox Add-on Migration Guide for porting existing add-ons to e10s. For general design information see the Multiprocess Firefox MDN documentation. Add-on testing compatibility is currently available at https://arewewebextensionsyet.com/. For more information about Add-on issue mitigation and rollout of e10s to add-on users, see the Add-on Project Wiki page. Invitation: Contact Erin Lancaster (:elan) for an invite. Invitation: Contact blassey, jimm, or larissa to get added to the meeting invite list. Invitation: Contact billm to get added to the meeting invite list. This page was last modified on 15 May 2018, at 14:14.